At the beginning of November I began a month of blogging everyday. I really enjoyed posting a lot more this month and actually found it helped a lot with my inspiration. I've posted more about fitness which is something I'm really passionate about. Tomorrow I've got a little introduction post going up about my new series I'll have for December. I'm hoping to continue posting a lot more, maybe sticking to every other day, when I finish my new series! 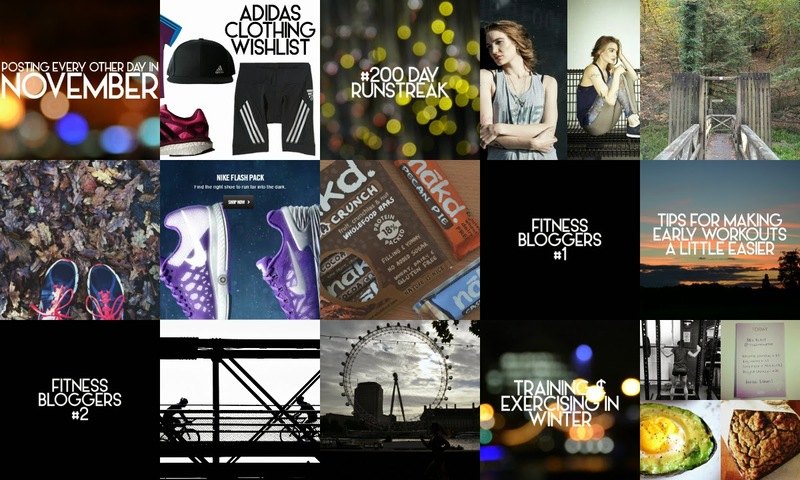 Adidas Clothing Wishlist, 200 Day Runstreak, Lexie Sport 13.3 Collection, Lydford Gorge, Sunday & new running songs, Nike Flash Collection, Nakd Bars, Fitness Bloggers #1, Making Early Workouts A Little Easier, Fitness Bloggers #2, Getting Up After Your First Bike Fall, Learning From A Bad Run, Training & Exercising in Winter, The Food Medic. Let me know what you thought of the posts this month or if you'd like to see more of anything on my blog. Tweet me @afloralcrown.